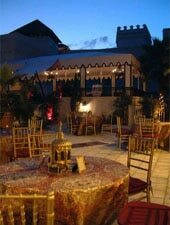 Haute eclectic cuisine in an ornate, Moorish-revival setting. : It's impossible to separate dinner at 95 Cordova from the experience of walking into the historic Casa Monica Hotel. The intimate, ornate property --- built at the behest of railroad magnate Henry Flagler in 1888 --- combines the fancifully carved arches, fountains and tiles of Moorish architecture with the jewel-toned, overstuffed trappings of the Victorian era. And amidst the beaded curtains and fabric-draped ceilings sits a restaurant that boasts a something-for-everyone menu. Asian spices, condiments and cooking techniques are liberally sprinkled over a bill of fare featuring Pacific Rim, French, Italian and American favorites. Don't miss the lobster and crab soup, which, unlike the bland bisques served at most restaurants, is spicy with cumin, coriander and fresh cilantro. Whether you succumb to the pan-seared sea bass or velvet-textured filet mignon, your entrée will likely come with a hearty rustic side of chunky mashed potatoes or a rich helping of wild mushroom risotto. But save room for dessert, perhaps the Meyer lemon and lavender pot de crème.